The Portuguese found Saint Helena uninhabited, with an abundance of trees and freshwater. They imported livestock, fruit trees and vegetables, and built a chapel and one or two houses. Though they formed no permanent settlement, the island became crucially important for the collection of food and as a rendezvous point for homebound voyages from Asia. English privateer Francis Drake very probably located the island on the final lap of his circumnavigation of the world (1577–1580). Further visits by other English explorers followed, and, once St Helena's location was more widely known, English warships began to lie in wait in the area to attack Portuguese carracks on their way home from India. In developing their Far East trade, the Dutch also began to frequent the island and made a formal claim to it in 1633, but did not settle the isle and by 1651 largely abandoned it in favour of their colony at the Cape of Good Hope. In 1657, the English East India Company was granted a charter to govern Saint Helena by Oliver Cromwell, and the following year the Company decided to fortify and colonise the island with planters. The first governor, Captain John Dutton, arrived in 1659, and it is from this date that St Helena claims to be Britain’s second oldest remaining colony, after Bermuda. A fort was completed and a number of houses were built. After the Restoration of the British monarchy in 1660, the East India Company received a Royal Charter giving it the sole right to fortify and colonise the island. The fort was renamed James Fort and the town Jamestown, in honour of the Duke of York and heir apparent, later King James II of England and VII of Scotland. The Kingdom of England became part of the new Kingdom of Great Britain in 1707 and then the United Kingdom in 1801; the British Empire grew into a global great power. The most important and first settled, the island of Saint Helena, had been governed by the East India Company since 1659. It became internationally known as the British government's chosen place of exile of Napoleon Bonaparte, who was detained on the island from October 1815 until his death on 5 May 1821, and it was made a British crown colony in 1834 by the Government of India Act 1833. Unoccupied Ascension Island was garrisoned by the Royal Navy on 22 October 1815, shortly after which the end of the Age of Sail made its difficult location in the equatorial doldrums less important relative to its strategic importance as a centrally positioned naval coaling station. For similar reasons Tristan da Cunha was annexed as a dependency of the Cape Colony (British South Africa) on 14 August 1816, at the settlement of the Napoleonic wars. For a short period just previously, Tristan da Cunha had been inhabited by a private American expedition who named the territory the Islands of Refreshment. The United Kingdom and the United States still jointly operate the airfield (RAF Ascension Island) on Ascension, which also serves as a space-based communications, signals intelligence, and navigation nexus and hub (Ground station). One of only four GPS satellite ground antennas is located there. The territory stretches across a huge distance of the South Atlantic Ocean with the northern-most island, Ascension, having a latitude of 7° 56′ S of the equator and the southern-most island, Gough Island, at 40° 19′ S. Between Saint Helena and Tristan da Cunha is the Tropic of Capricorn. The distance between the northern tip of Ascension Island and the southern tip of Gough Island is 2,263 miles (3,642 km) (an equivalent distance between London and the Dead Sea). The whole territory lies in the Western Hemisphere and has the same time zone: Greenwich Mean Time. Daylight saving time is not observed. Although all three parts of the territory were formed by volcanic activity, only the Tristan da Cunha group of islands are volcanically active at the moment. The highest point of the territory is Queen Mary's Peak on the island of Tristan da Cunha, with an elevation of 2,062 metres (6,765 ft) above sea level. The mountain is listed as an ultra prominent peak. Because of the massive distance from north to south (over 3,600 kilometres (2,200 mi)), the territory has various climates. Ascension has a warm, arid climate, with temperatures all year long into the 20 °C. St Helena is more moderate (and arid near the coasts). Tristan da Cunha, being closer to the Antarctic Circle, is much cooler and a lot wetter. The uninhabited southernmost Gough Island is wetter and has freezing winter temperatures. The territorial waters of the islands extend out to 12 nautical miles (22 km) from their coastal baselines. The Exclusive Economic Zones (EEZs) extend 200 nautical miles (370 km) from the islands' baselines. Despite their size, the three EEZs do not overlap or touch one another, nor do they reach the EEZs of any other country or territory. The territory has the largest EEZ of any of the British overseas territories (indeed larger than the United Kingdom's) and if included in the ranking of countries by size of EEZ, the territory would be 21st, behind Portugal and ahead of the Philippines. Neither the islands nor their EEZs are the subject of any current international dispute. An application was made in 2008 by the United Kingdom to the United Nations Commission on the Limits of the Continental Shelf to extend the limit of the continental shelf claim of Ascension Island beyond 200 nautical miles (370 km). The Commission recommended in 2010 that the limit not be extended beyond the standard limit, based on scientific surveys. The Saint Helena, Ascension and Tristan da Cunha Constitution Order 2009 (an Order in Council of the Privy Council of the United Kingdom) enacted a new constitution for the territory, which came into effect on 1 September 2009. Although raising Ascension and Tristan da Cunha to equal status with Saint Helena, the constitution is divided into three chapters, one for each part of the territory. 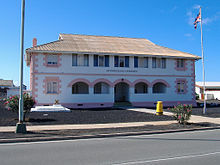 Saint Helena has a Governor and a Legislative Council, whilst Tristan da Cunha and Ascension each have an Administrator and an Island Council. Notably the constitution includes (for each part of the territory) the "fundamental rights and freedoms of individuals". Most residents of St. Helena belong to the Anglican Communion through the Anglican Church of Southern Africa and are members of the Diocese of St Helena, which has its own bishop and includes Ascension Island. Roman Catholics are pastorally served by the Missio sui iuris of Saint Helena, Ascension and Tristan da Cunha, whose office of ecclesiastical superior is vested in the Apostolic Prefecture of the Falkland Islands. Currently as of October 2018 there is no official flag for the whole of the overseas territory so the Flag of the United Kingdom is used for all official purposes; however, each of the three individual islands does have its own flag for official use. Between 2002 and 2013 Saint Helena and Tristan da Cunha each had their own separate flags, whilst Ascension Island used the Union Flag, and before 2002 the flag of Saint Helena was used in Tristan da Cunha for all official purposes. The flag of Saint Helena was adopted on 4 October 4 1984. It is a defaced (i.e. differentiated) Blue Ensign, i.e. a blue field with the Union Jack in the upper hoist-side quadrant and the shield from the coat of arms of Saint Helena centred on the outer half of the flag. The shield features a rocky coastline and a three-masted sailing ship, with a Saint Helena plover, also known as a wirebird, atop. The flag of Ascension Island was adopted on 11 May 2013  The flag is a blue ensign design, defaced with the coat of arms of Ascension Island. Prior to the adoption of this flag, the island used the Union Flag of the United Kingdom for official purposes. Prior to the adoption of the current flag the Union Flag was used for all official purposes. The flag of Tristan da Cunha was adopted on 20 October 2002, in a proclamation made by the Governor of Saint Helena under a Royal Warrant granted by Queen Elizabeth II. Prior to this, as a dependency of Saint Helena, Tristan da Cunha used the flag of Saint Helena for official purposes. The flag is a blue ensign design, defaced with the coat of arms of Tristan da Cunha — a Tristan longboat above a Naval Crown, with a central shield decorated with four yellow-nosed albatrosses and flanked by two Tristan rock lobsters. Below this is a scroll with the territory's motto, Our faith is our strength. Each of the three main islands has a harbour or small port, situated in the islands' chief settlement (Georgetown, Jamestown, and Edinburgh). In addition St. Helena has a 118m long permanent wharf facility, built as part of the airport project, in Rupert's Bay for bulk, containerised and general cargos as well as passenger landings. St. Helena Airport received its first scheduled commercial flight on 14 October 2017. Commercial flights, operated by Airlink, using an Embraer E190, are scheduled from OR Tambo Airport in Johannesburg each Saturday, returning the same day (or Sunday on weekends where the extension to Ascension Island is operating). Commercial flights between St. Helena and Ascension Island operate on the second Saturday of each month, with the aircraft returning to St. Helena on the Sunday, before continuing on to Johannesburg. A military airfield exists on Ascension Island (RAF Ascension Island), though potholes on the runway resulted in the April 2017 cancellation of all but essential personnel/supply flights as well as emergency medical evacuations. Regular RAF flights connected Ascension with RAF Brize Norton in the UK and RAF Mount Pleasant in the Falkland Islands, a transport link called the South Atlantic Air Bridge. The flights are mainly to transport military personnel, though the RAF did allow fare-paying civilians to use them. Ascension Island is also used by the US military (which supply the base using MV Ascension) and was a designated emergency landing site for the Space Shuttle program. The islands of Tristan da Cunha can only be accessed by sea since the lack of an own airport. Saint Helena has 138 kilometres (86 mi)—118 kilometres (73 mi) paved and 20 kilometres (12 mi) unpaved—of roads. Tristan da Cunha has approximately 10 kilometres (6.2 mi) of paved roads, while Ascension has around 40 kilometres (25 mi) paved. Each island has its own vehicle registration plate system. Traffic drives on the left in all three parts of the territory, as is the case in the United Kingdom itself. Two of the nearest countries to the islands—South Africa and Namibia—also drive on the left. ^ a b "The World Factbook — Central Intelligence Agency". www.cia.gov. Archived from the original on 28 December 2010. Retrieved 14 April 2018. ^ Pew Forum Research 2010 Archived 24 September 2015 at the Wayback Machine Page 49. December 2012. Retrieved 27 May 2017. ^ "St Helena, Ascension and Tristan da Cunha Constitution Order 2009, see "EXPLANATORY NOTE"". Archived from the original on 12 March 2010. Retrieved 26 September 2009. ^ a b The St Helena, Ascension and Tristan da Cunha Constitution Order 2009 Archived 11 May 2011 at the Wayback Machine The Constitution (in the Schedule to the Order). ^ "History: St. Helena homepage". Archived from the original on 16 July 2012. Retrieved 24 December 2009. ^ "Census 2016 – summary report" (PDF). St Helena Government. June 2016. p. 7. Archived (PDF) from the original on 17 October 2016. Retrieved 23 January 2017. ^ "A HISTORY MAKING WEEKEND FOR ST HELENA". St Helena. 16 October 2017. Archived from the original on 20 November 2017. Retrieved 14 November 2017. ^ "FIRST COMMERCIAL FLIGHT TO ASCENSION ISLAND". St Helena. 14 November 2017. Archived from the original on 15 November 2017. Retrieved 14 November 2017. ^ "South Atlantic Airbridge ops at Ascension Island suspended". ch-aviation. Archived from the original on 28 April 2017. Retrieved 12 December 2017. ^ editor, Patrick Wintour Diplomatic (2 May 2017). "Runway potholes halt regular Ascension Island flights". The Guardian. ISSN 0261-3077. Archived from the original on 2 May 2017. Retrieved 12 December 2017. Wikimedia Commons has media related to Saint Helena, Ascension and Tristan da Cunha. Wikivoyage has a travel guide for Saint Helena, Ascension and Tristan da Cunha. "Saint Helena, Ascension and Tristan da Cunha". The World Factbook. Central Intelligence Agency.